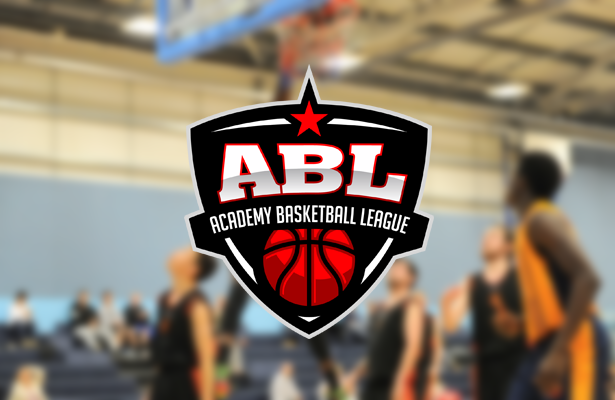 The ABL is pleased to announce the 2017-18 regular season awards, as voted for by coaches around the league. The league was split into four conferences with an increased number of teams in the ABL’s third year of existence. Eisley Swaine, Afra Khalil, Jason Prince and Aaron Badibo took top honours of Player of the Year in their respective Conferences. Queen Ethelburga’s Swaine scoops his second Player of the Year award after ranking third in the league in scoring with 28.3 points per game. He also averaged 6.9 points, 7.6 assists and 3.4 steals per game with an efficiency ranking of 32.3 – second in the league. “This year has been great,” said Swaine. “I have been surrounded by great players and coaches; all wanting to work hard every time they step on the floor. I have enjoyed every second of being part of this programme and receiving this award is a bonus. QE Head Coach Josh Metcalf added: “We have been extremely lucky at QE to have had such an incredible player and person around for three years. Eisley has elevated the level of all of his team-mates every day and has been a tremendous ambassador for our school. “We also have to give a huge amount of credit to Chris Mellor at Bradford Dragons giving Eisley the platform at Division One level and for really prioritising his development. Swaine is joined in the All-First Team in the Northern Conference by Aston Manor’s Zack Powell (22.9ppg, 6.6apg, 4.0spg), South Cheshire guard Max Jones (29.5ppg, 10.7rpg), Dylan Magloire of Stoke (19.5ppg, 10.5rpg, 3.4apg) and the league’s leading scorer, Tyne Met big Ben Hogg (33.4ppg, 13.0rpg, 2.9bpg) – who also claims the Defensive Player of the Year once again. The All-Second Team features Stoke team-mates Marcel Kofi (14.5ppg, 9.0rpg, 6.3apg) and Michael Jara (18.9ppg, 3.8spg), Aston Manor duo Conroy Hayden (13.6ppg, 11.4rpg) and Mo Abushego (22.3ppg 2.1spg) along with Archbishop Beck’s Phil Deveney (19.5ppg, 8.4rpg). The Coach of the Year award went to Stoke’s Shawn Jamison as his side topped the Conference with a 12-1 record in their first season in the ABL before advancing to the Championship final. In the Central Conference, Khalil had a big season for Alec Reed with 25.3 points per game to rank inside the top 5 of scorers in the league. He also had a true shooting percentage of 63.5 inside the top 10 as well as adding 4.9 steals for joint-third in that category. “First of all, I would like to thank ABL for awarding me with this award,” he said. “Two people that helped me reach my potential this year is my academy coaches Daniel Szatkowski and Jack Majewski – who don’t just provide us with team trainings but individual sessions especially Daniel. “Without Daniel’s coaching everyday I wouldn’t have had such a great season. Three more people I would like to thank is coach Deane Williams, Daniel Ivan and Afiz Olaniyan – they helped me a lot to develop my game. Khalil leads the All-First Team with team-mate Elias Poorman (12.0ppg, 6.6rpg, 5.0apg, 4.9spg) also picking up the Defensive Player of the Year award with Haringey’s Taiwo Badmus (20.1ppg, 7.9rpg), Jonathan Bourne (14.7ppg, 6.2rpg) of County Upper and Aylesbury’s Aalim Shamsideen (20.5ppg). In the All-Second Team, Alec Reed are further represented through Victor Olarerin (15.8ppg), while Moulton’s Hayden Alcindor (18.8ppg, 10.3rpg, 3.0spg) features as well as CoHENEL’s Kane Smallwood (12.0ppg, 7.8rpg), James Morris (21.0ppg) of Long Road and County Upper guard Stefan Petkovic (12.3ppg, 4.2rpg). The Coach of the Year award went to Daniel Szatkowski as his Alec Reed side had a strong season to finish second in the Central Conference prior to their run to the ABL Championship final. “First of all I would like to say thank you to ABL league for such a nomination,” he declared. “I know it would know be possible without help from Alec Reed Academy who supports our programme in the best possible way. Prince had a strong season for Raines as they made their debut in the ABL. The 2000-born guard averaged 23.1 points per game along with 5.7 rebounds and 4.3 assists to help his side to an 8-2 record during the regular season. 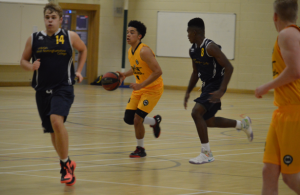 Sayone Sriskantha (18.0ppg, 4.1apg, 3.5spg) joins his team-mate in the All-First Team with Josh Moore (18.6ppg, 12.9rpg) of Northfleet also making it alongside Erith’s Anthony TJ Hibbert (13.8ppg, 13.3rpg, 2.5bpg) and Michael Adegayo (15.3ppg, 5.0apg, 5.4spg) – who also scoops the Defensive Player of the Year award. In the All-Second Team, Simon Olanipekun (17.1ppg, 4.7apg, 3.3spg) and Tyrel Robinson (16.0ppg, 5.0rpg) continue the success for Raines, Issy Solomon (13.3ppg, 11.0rpg) represents The North School and Erith have two ore players selected in Joshua Adeniyi (9.6ppg, 10.4rpg) and Mohamed Fofonah (11.6ppg, 4.0apg, 4.6spg). The Coach of the Year award goes to Steve Bucknall after leading his Erith side to a perfect 10-0 record during the regular season. 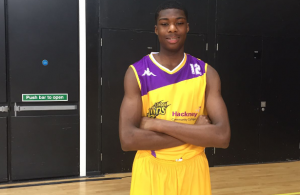 Badibo finished as the fourth leading scorer in the league with 26.7 points per game as he impressed for Hackney in a tough conference. He also averaged 6.4 rebounds along with 4.1 assists and 3.2 steals during the regular season and completes an awards double by being named Defensive Player of the Year. “I am very grateful to be selected for Player of the Year and Defensive Player of the Year,” he said. “This really shows that hard work pays off. 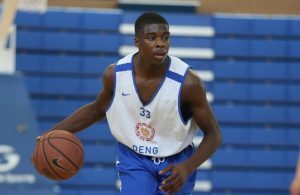 Firstly I want to thank my coaches for increasing my role in the team this year – I feel like if it weren’t for them pushing me in practice and games I would have never achieved this award – this has also allowed me learn many new things about the game of basketball and add many aspects to my game. John Roan team-mates James Aboaba (17.3ppg, 9.3rpg) and Abdulawahab Ayinla (18.7ppg, 9.3rpg, 4.3apg) join Badibo in the All-First Team along with Leyton’s Titas Zydelis (15.9ppg) and Emmanuel Eze (12.8ppg, 8.8rpg) of Harris. The All-Second Team features SRWA duo Luke Moore (16.2ppg, 9.0rpg) and Aaron King (15.8ppg, 6.3rpg) as well as Hackney’s Jaylon Braithwaite (12.2ppg), Josh Otor (18.0ppg, 8.7rpg, 2.3spg) of Holy Trinity and Harris’ Bradley Kaboza (15.2ppg, 6.1rpg, 3.4apg). Patrick Avorkiliya earns the Coach of the Year award after helping St Charles recover from a slow start to finish on top of their Conference with a 10-2 record. Please note: All awards were based on regular season only.